Australian safety signs have been categorised into 6 main types in order to apply a consistent design across similar functions. By understanding the types of signs and their purpose, you can determine what you need in your workplace and where to display them. When you need to tell people that they can’t do something, you’ll need a Prohibition Sign – you know, the one with the universally recognisable red circle with a diagonal line through it. 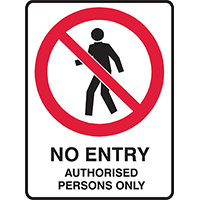 Keep people from entering private property with a NO ENTRY sign or signal that people aren’t allowed to smoke in an area with a NO SMOKING sign. A Mandatory Sign is a must when you have an instruction that has to be followed. You’ll recognise these by a white symbol or pictogram within a blue circle on a white background. 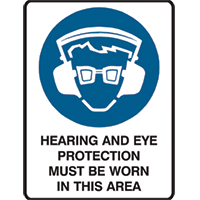 If your workplace requires protective clothing or equipment, for instance, you’ll have seen signs like: Foot Protection Must Be Worn In This Area or Hearing and Eye Protection Must Be Worn In This Area. You can also have just a word message with no image for Mandatory Signs, with the words in black on a white rectangular background. 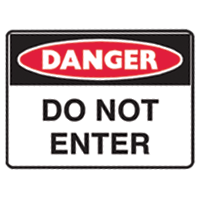 If you need to warn people about potentially life-threatening hazards or hazardous conditions, you need to use a Danger Sign. The familiar red oval inside a black rectangle with the word DANGER in bold, capital letters, alerts people to the threat. Common Danger Signs include HIGH VOLTAGE and DO NOT ENTER. When the hazard or hazardous conditions aren’t life-threatening, a Warning Sign lets you know you could still get hurt. These are easy to identify with their yellow background and black triangle around the hazard symbol. 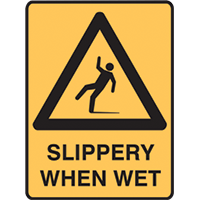 SLIPPERY WHEN WET is a commonly recognisable Warning Sign. If something does go wrong, Emergency Information Signs help people to find the location of, or directions to, your emergency related facilities, like emergency exits, first aid or safety equipment. 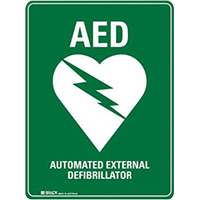 The green background with white writing and symbols is instantly identifiable for safety, with common signs like, FIRST AID KIT, or EMERGENCY PHONE. The bright red of Fire Signs makes them easy to spot around fire alarms and fire-fighting equipment. All text and imagery is white and stands out against the red background. 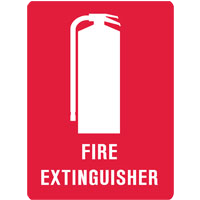 Fire Signs are available to indicate the location of all your fire equipment, like fire extinguishers, fire blankets, fire hoses, and more. This categorisation demonstrates the importance of compliant safety signage that meets the colour and design principles laid out in the Australian Standard. By using consistent safety signs you can increase awareness and compliance to their messaging. If you need advice on the appropriate safety signage requirements for your workplace, contact us today.